Notes: Based on the "Mermaid Saga" manga by Takahashi Rumiko, another chapter of which is also available in animated form (Mermaid Forest). The flesh of the mythical mermaid has been long sought throughout the ages...it is said that one who eats of the mermaid's flesh will gain eternal life. However, what the legend fails to say is that there is also a likely chance that the mermaid's flesh may also turn you into a mindless, homicidal monster known as a Lost Soul. Yuta and Mana have eaten of the mermaid's flesh and have consequently lived for the last few hundred years without aging another second. As a result, they do a lot of wandering, moving restlessly from place to place in search of new people and experiences. Upon arrival at their newest destination, Yuta earns a job as a construction worker, and the two meet a rather peculiar family: a woman and her 8-year-old son. For some reason, the son seems terrified of his mother, shying away from her at every opportunity. It seems that the mother is a bit of a curiosity among the townsfolk, having apparently survived several lethal-looking accidents and completely healing the next day without a trace of a scar. Curious, the two decide to investigate further, but it turns out that the situation is much more dire than it appears. The mermaid's flesh once again made its indelible mark, and the folly of humankind has once again twisted it into something more horrible than anyone could ever imagine. Will the two solve this case before the mermaid's flesh takes yet another victim? Not too many people know that Ranma 1/2 and Urusei Yatsura's Rumiko Takahashi also enjoys writing horror as well as slapstick comedy. With stories like Mermaid's Scar, though, that reputation is sure to become stronger. 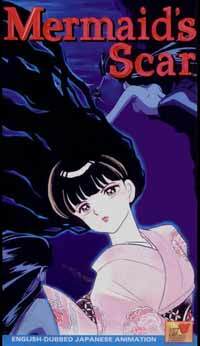 Mermaid's Scar is one of the most disturbing and horrifying anime you will be able to find, and it's a rare treat to see good writing being applied to the genre. While most anime would prefer to achieve its horror by bathing the set and characters in blood and gore, Mermaid's Scar knows much better than that. The level of gore is actually quite minimal compared to most other horror productions, although there is certainly enough to satisfy just about anyone. Mermaid's Scar's horror is instead achieved by its artful delving into the depraved state of humanity, where greed and lust for power is able to twist anything into an object of perversion. The story is unpredictable and startling from the get-go, lulling you into feeling that you know what's going on and then drastically introducing a new element that changes everything time and time again. By the time you've unraveled the mystery, it's too late: people will have already died and immeasurable prices will have already been paid. And all because of a thing called power. In typical Viz style, the OAV is technically very solid as well. The art and animation are crisply executed (although Viz didn't have much to do with that), and the dubbing job is excellent, definitely adding to the chilling effect of the OAV. If you're looking for a horror film that will continue to gnaw at you even after credits have rolled, give Mermaid's Scar a try. Recommended Audience: Definitely not for kids. The scenes of violence that are in this title are sufficiently gory enough to make it inappropriate for younger audiences. Also, the general theme of child against parent, parent against child will probably greatly disturb young children (heck, it disturbed _me_). An older audience would best appreciate this program.